Ready for a tale of two sisters? Melissa and Beth, lifetime adventure seekers and outdoorswomen, also share a love of nature and a commitment to low-impact and sustainable eco-friendly practices. 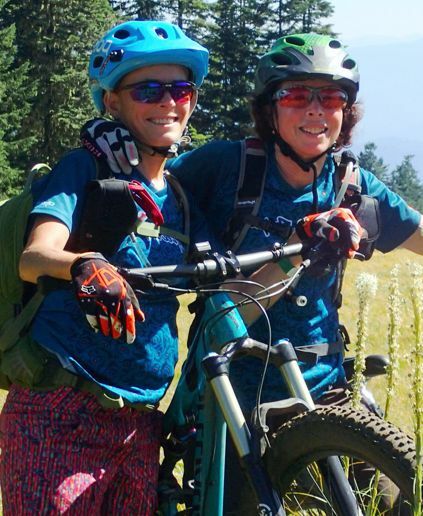 Beth's a physician, backpacker, mountain biker and trail builder. Melissa is an engineer, inventor, web entrepreneur, and an avid cyclist. Something was bound to happen! Women have been using "pee rags" since, well, as long as rags have been around. With the advent of disposable tissues in the early 1900's, modern society quickly decided this was an item for the history books. But was it? The popularity of outdoor recreation has exploded in the last 50 years, and so have the scars on our wilderness areas. Forward-thinking women have called a halt to the unsightly tissue issue, and have brought back: The Pee Rag! Never ones to do anything halfway, Melissa and Beth pondered the issue of the pee rag. What was the best fabric? What size? How would it attach to your pack, yet still be washable? How best to tell your pee rag from your friends' pee rags? How do you make sure your pee rag is never, EVER, mistaken for anything else? After considerable thought, experimentation, and testing, it was time to reveal their findings. So, Melissa and Beth have teamed up to bring you the next generation of pee rags. We call them the "WeeRag". Check out our classy collection of lightweight, absorbent, quick-dry, washable, reusable pee rags. It's time to boldly "go" where you have never gone before. And, leave no trace! BONUS! We donate 10% of every sale to our local volunteer trail-building association, SATA (Salem Area Trails Alliance), who is building trails in Oregon's Silver Falls State Park. Check them out, if you're out this way!